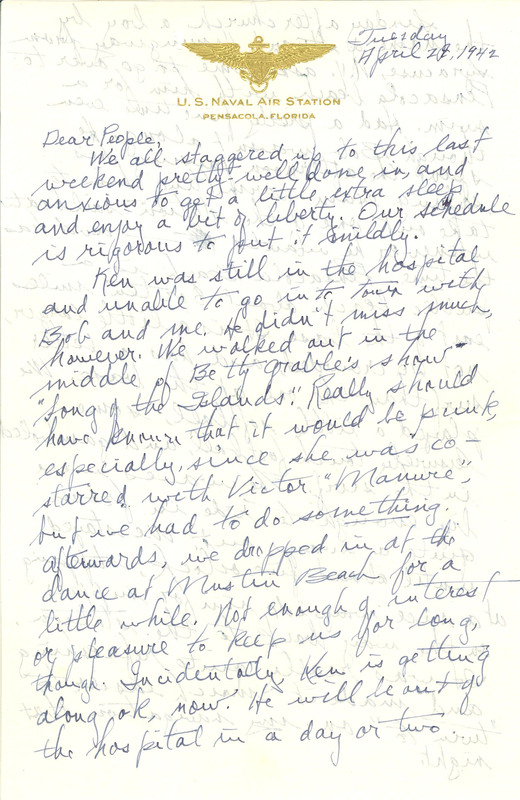 Tuesday April 29, 1942 U. S. NAVAL AIR STATION PENSACOLA, FLORIDA Dear People, We all staggered up to this last weekend pretty well done in, and anxious to get a little extra sleep and enjoy a bit of liberty. Our schedule is rigorous to put it mildly. Ken was still in the hospital and unable to go into town with Bob and me. He didn't miss much, however. We walked out in the middle of Betty Grable's show "Song of the Islands." Really should have known that it would be punk, especially, since she was costarred with Victor "Manure", but we had to do something. Afterwards, we dropped in at the dance at Mustin Beach for a little while. Not enough of interest or pleasure to keep us for long, though. Incidentally, Ken is getting along ok, now. He will be out of the hospital in a day or two.